NEWPORT – Oregon State University marine mammal researcher Markus Horning steps to the bar for this month’s Science on Tap lecture, with The secret lives or seals: Using high-tech marvels to pry into ocean depths. The talk, co-sponsored by the Hatfield Marine Science Center and Rogue Ale, starts at 6 pm March 15 at Brewers on the Bay, on the South Beach waterfront south of the Yaquina Bay Bridge. Admission to the family-friendly event is free, and food and beverage will be available for purchase from the pub’s menu. Horning, a pinniped ecologist with OSU’s Newport-based Marine Mammal Institute, studies seals and sea lions in Oregon, Alaska and the Antarctic using telemetry – the science and technology of remote measurement via such devices as satellite-linked data recorders and tags. The technology allows Horning and other scientists to monitor rarely observed aspects of marine mammal life in remote locations around Alaska and the Antarctic. Using advanced monitoring technology, researchers are able to follow the life – and death – of individual animals in the Bering Sea or under the Antarctic ice. 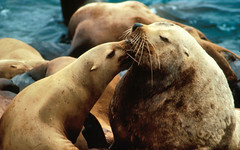 In recent research, the high-tech tools have helped show that more juvenile Steller sea lions are falling to predators than had been thought, casting doubt on prospects for the animals’ ability to recover from recent population decline in Alaskan waters. Dr. Horning’s Pinniped Ecology Applied Research Lab at HMSC.